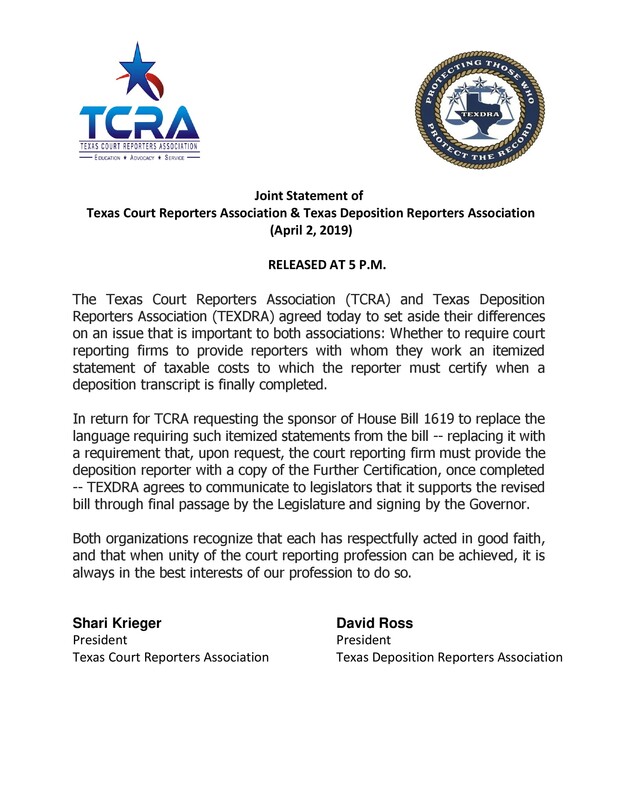 TEXDRA is very happy to report to our members that TEXDRA and TCRA have reached an agreement on language in HB 1619 and that this important bill now has TEXDRA's full and unwavering support. We'd like to thank TCRA for their hard work in crafting the bill and also thank Representative Leach, Chairman of the House Judiciary and Civil Jurisprudence Committee and the bill's sponsor, for his time and attention. Thanks also to TEXDRA's lobbyist, Keith Oakley, for his help. Most importantly, we thank our members for their generosity and support. You may download TCRA and TEXDRA's joint statement by clicking here. 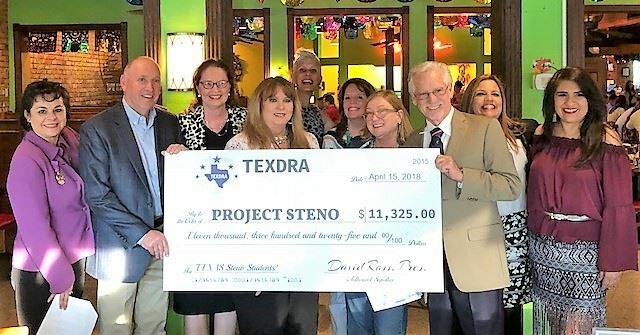 TEXDRA's initial fundraising drive for Project Steno has concluded and was a resounding success!! Many sincere and heartfelt thanks to all of the generous donors that made this happen. TEXDRA's members are the best! Have you heard about Project Steno's efforts? In a nutshell, Project Steno is designed to help promising new reporting students, recruited through the A to Z Program, with their court reporting school tuition. As we all know, WE NEED MORE REPORTERS! The shortage of court reporters is critical, and TEXDRA is taking action. TEXDRA recently concluded our first A to Z class, and there are many more classes happening statewide. We need to help these bright new students achieve success! Please watch this site and our Facebook page for additional updates very soon or Follow @TEXDRA on Twitter. Also, check out the News page for the latest updates on JBCC and Court Reporters Certification Advisory Board activity. Work will begin very soon on the Texas UFM, and if you have any questions or suggestions, please e-mail us at UFM@texdra.org. We're listening! TEXDRA is an association for Texas Certified Shorthand Reporters and Court Reporting Firms founded on the core principles of integrity, transparency, advocacy and teamwork. We pledge to serve our profession with honesty and hard work, and we will work closely with other associations whenever possible to recruit, train and mentor students, lobby in Austin on important issues and challenges that face us all, improve relations between us and the people we serve, and educate the judiciary and the public about the vital role we hold as impartial guardians of the record. If you're not already a member, please visit our Join Us page to join now. TEXDRA's Mission: To represent the professional and business interests of Texas freelance Certified Shorthand Reporters and Court Reporting Firms through advocacy, education, communication and transparency, while promoting the advantage of working with trained professionals who capture the spoken word in judicial proceedings and provide services to the deaf and hard-of-hearing community, and to foster better awareness of their value to the judicial system and the public. What's the Deal with the 1/3 Rule? (C) 2019 - TEXDRA. All rights reserved. TEXDRA is a 501(c)(6) non-profit organization.